CONTENTS: Contributors. Volumes in the Series. Optical Systems: Monochromators and Spectrometers: M. Koike, Normal Incidence Monochromators. H.A. Padmore, M.R. Howells, and W.R. McKinney, Grazing Incidence Monochromators. J.H. Underwood, Spectrograph and Monochromators Using Varied Line Spacing Gratings. A.P. Thorne and M.R. Howells, Intermerometric Spectrometers. Detectors: J.B. West, Gas Detectors. L.R. Canfield, Photodiode Detectors. O.H.W. Siegmund, Amplifying and Position Sensitive Detectors. S.V. Bobashev, Absolute Flux Measurements. R.L. Stockbauer, Vacuum Techniques. Application: Y. Vladimirsky, Lithography. H. Ade, Spectromicroscopy. Spectroscopy: M. Ginter and K. Yoshino, Optical. T. Calcott, Fluorescence. Index. 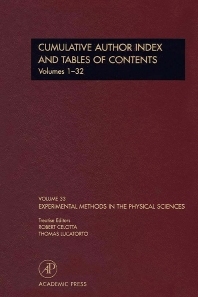 This thirty-third volume of the Experimental Methods in the Physical Sciences series provides a subject and author cumulative index for all previous volumes for easy reference.